Sungmin has a father, mother and a younger brother called Lee Sungjin. Sungmin’s first kiss is his closest friend Eunhyuk. He loves accesories picked by the people he loves. He once thought about changing his style on pink., but when he opened his closet, he saw his clothes were mostly pink. so he changed his mind. Sungmin’s closest friends during training is Xiah Junsu and Eunhyuk. Sungmin showers together with Eunhyuk. Sungmin always wears a golden ring on his pinky. He’s been wearing it since he was little. Sungmin already kissed Eunhyuk for about 3-4 times. Sungmin likes the times with Eunhyuk. But he said that when he had a girlfriend, we would love the times when he is with her. Sungmin is crazy over pink. When Sungmin was asked to finish the sentence, “Super Junior is..” He replied “a theme park”. Sungmin learned Chinese martial arts. He’s very good at it. Sungmin has told his noona fans to call him ‘oppa’ if it makes them feel better. Sungmin’s favourite singers are Lee SeungChul , KangTa and etc. Sungmin likes to play the piano in his spare time. Sungmin and Eunhyuk usually sleeps in the same bed. I think it’s because they were friends before Super Junior debut. Sungmin claims his cuteness is “natural”. Sungmin’s best friend in SJ is Shindong and usually goes to talk to Shindong about his personal issues and asks for advice from him often. Sungmin is so embarrased when he told SNSD Sooyoung that his first kiss was Eunhyuk and he already kissed Eunhyuk for about 3-4 times. Sungmin’s school was Myongji University. Sungmin likes being with himself. But he sometimes go along with Hyukkie. Sungmin likes the times of the day when the numbers were all the same like 1:11, 2:22, 3:33, etc. Sungmin likes the day Friday. The biggest lie that Sungmin told was “I don’t have money”. Sungmin like girls shorter than him ,cute, acts cute a lot, nice, sings well or likes music,does a lot of pretty actions amongst celebrities. Sungmin’s cellphones are pink LG Chocolate and iPhone. Sungmin’s car is Honda Civic. According to Kangin, Sungmin is very careful when he uses his car. Sungmin’s most important thing is his family. Sungmin loves to cook for his member. The whole kitchen is to himself. A present that Sungmin most wanted to receive from fans is Love. He feels thankful and loveable when he sees his fans. Sungmin likes to read Geu Rang Jyo comic. When asked what sungmin’s personality is, he said he’s docile. Something which Sungmin does better than others is acting pretty. Sungmin likes to eat hamburger. Superman, Spiderman, Batman, Wonder Woman, Transparent Being etc . Sungmin wants to be Spiderman the most. You would mostly see Sungmin at SM or at his house. The reason why Sungmin wants to become a celebrity because he loves music. Kyuhyun’s dad said that Sungmin is handsome. Heechul kissed Sungmin and affected the relationship of Kangin and Sungmin. Sungmin was a DJ of a radio program called Chunji Radio. He first DJed with Sooyoung then Sunny. Sungmin’s ideal girl is a girl with 158cm tall. Sungmin’s dad is the owner of the Sendbill Company. In SJ T Idol World, SJ members were asked to play a mini drama (Goong T) about some kind of king queen thing.. After Sungmin’s crying part, Sungmin can’t stop crying…so Eunhyuk laughs at him. Sungmin doesn’t like to receive gifts especially expensive ones. He will accept clothing as long as its nothing that was too expensive (such as brand clothing, he’ll take it back to the girls that give it to him). He mentioned before that fans bought him a laptop and he returned it to them and another time he received a nice digital camera and he returned it to the fansite that bought it for him. He says various things like spend the money on food for yourself, or for books for school, and his most favorite, for gifts for your parents. Sungmin is the one who teaches Sunny guitar. Sungmin is the second richest in Super Junior. Sungmin has lost his wallet twice. The first time, the wallet was never found but fortunately the second time the wallet was returned by someone who found it. He has a special charm, and knows how to use it. Sungmin is the “Pretty Boy” of Super Junior. Sungmin get’s really cute when he’s drunk so Heechul had to slap him to snap him out of it. The other members of SJ think he’d be the best candidate for getting caught cheating on his gf. Sungmin is good at massages. He took classes. For x’mas, Sungmin wants to give Kangin gloves as X’mas present. Sungmin likes to wear knee-length nighties. Sungmin doesn’t know how to tell jokes. Sungmin is envious of Kyuhyun’s singing voice. Sungmin could fell asleep easily at the count of three. Sungmin is the most frugal out of all the members. Sung Min also mastering in martial arts. Sungmin never really kissed a girl, he told that at chunji radio. Sungmin’s worst score in noraebang is…. 0! Sungmin is very manly in front of guys. but when he face girls, he becomes so gentle. sungmin wears pink doraemon shirt to sleep. Sungmin is also one of the main dancers with EunHyuk, ShinDong, DongHae and LeeTeuk. Sungmin is a major in Film Musical. Minnie hobbies: chinese matrial arts, watching movies, and playing musical instruments. 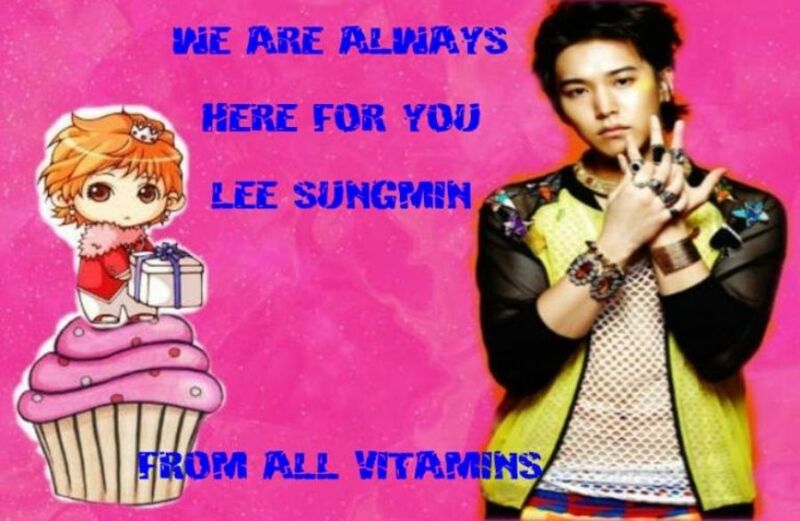 Sungminnie is a blood type A! Some people call them perfectionists. One MC have asked teukie before, if super junior members are girls, he will pick sungmin as his girlfriend because teukie love the way sungmin does aegyo! He said that sungmin is soooo cute! Sungmin loves to drink wine. In Sungmin’s high school grades, his highest was 98%. But he just said “secret” and refused to say his lowest grade. Sungmin doesn’t like his fans fighting. QUESTION: Who would you bring to a deserted island? ANSWER: Hyukkie…mmm…its a secret~…so we can sing together so we wont get bored. When Sungmin sees blood, it hurts him. The first album that Sungmin bought was H.O.T. 3rd album. Among lead pencil, lead, eraser, and pen…he mostly bought pens. When Lee Sungmin was a student, he said he had nothing to say, wasn’t funny, and quiet. Sungmin’s fave season is when the cool breeze blows. The longest time Sungmin was on phone was 2 hours.